“You can’t build a consumer brand in 2018 and ignore the 800-pound Gorilla that is Amazon” (Sophie Baker, How to Beat Amazon). Amazon has exploded onto the business scene the last few years and it has become a force to be reckoned with for any product, consumer-based company. They provide any number of products, from the largest like a 1,325-pound gun safe to the tiniest item like the world’s smallest Bluetooth speaker that can fit in the palm of your hand. There’s the clever product (a mug that won’t tip over for all those clumsy drinkers), the helpful item (IFetch – your dog can play fetch all by himself), and the downright bizarre (a Nicolas Cage pillow because why not?). Virtually anything a consumer can think of, Amazon can provide. And to top it all off, a shopper can order any of these products without even having to get out of bed. How can any other business possibly compete? Amazon literally has it all. Well like any Titan, there is an area where they are vulnerable. Achilles had his heel, Macbeth has his blind ambition, Marie Antoinette had her cake, and Amazon has its customer experience. And by that, we mean it doesn’t have the customer experience. How can it possibly create an experience for its customers when the customer is in control of all of that (will Michelle buy her Shea Moisture Curl and Shine Shampoo from her iPhone 8 sitting on her green velvet sofa or on will Brian purchase his Sony Extra Bass Wireless Headphones on his Apple MacBook Pro on his lunch break?). This is the chance to get the upper hand. In our last blog, we explored why signage can help you fight back at Amazon because of this very reason – that it helps create a better customer experience. Furthermore, because signage is the original form of marketing and it gives consumers back some control, it is the ideal way to stand out from the Amazonian giant. Today, we will look at 3 more reasons your business can fight back at Amazon with signage. This may seem like an odd place to start. Isn’t something concrete like material usually something you get to after you have gone over all the fluffy, vague reasons like “draw your customers to you” or “tell your best story”? While it is important to emotionally appeal to our readers, we know that you are in a business and so you need to literally get down to business. And you may be reading this blog sitting in an office that has a sign hanging right outside your store. Which means you need a reason to keep reading. Well, here it is. Excuse me while we get emotional for a second. Take a look at your sign. What type of message is it sending? Does it tell of a quality business that takes its customer’s needs seriously or does it look like a sign that was quickly ordered and quickly made? Was it a priority marketing tool that you invested in just like you will invest in your customers or was it an afterthought that might lead your clients into thinking that they themselves might become an afterthought? It is not enough to just have a sign. A business must have a sign that reflects with its quality of material the quality of the service. Especially since “three out of four consumers say they have told someone about a store based simply on signage” (Source). Your company provides the best service it can, so make sure that your sign reflects that. Choose from quality signs made out of the best materials like Gold Leaf Signs, Internally LED Illuminated Storefront Signs, or Wood Lobby Signs. Once you have a sign that tells of the quality company that you are, your sign will show potential consumers that you are a company that takes itself and its customers seriously. Your sign can send any number of powerful messages. A strong Monument Sign tells customers that you are reliable and dependable. A custom-made 3D Sign shows consumers that you are are creative and interesting. A Gold Leaf Sign sends the message that your company is literally “as good as gold”. Why is this important? Studies have been done that explain that when it comes to new business “a vast majority of what you’ll get comes from people who live within 5 miles of your store. That means the average person will see your sign about twice per day, or about sixty times per month” (Source). Those are a lot of opportunities to send the right message or the wrong one. Which one does your business sign send? “Your business can survive only if your customers feel attracted to your products and services” (successstory.com). 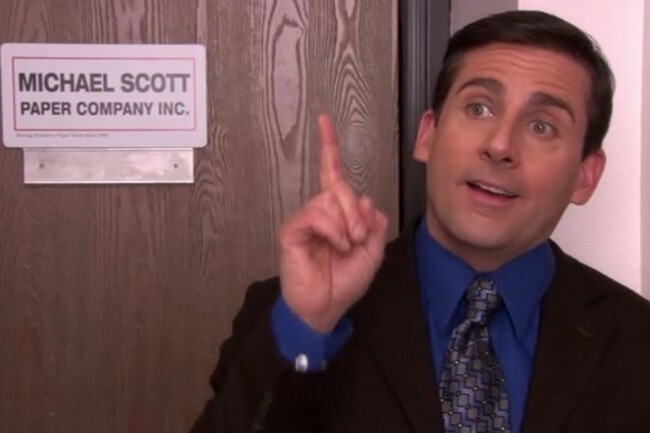 You can have the best Chinese food in the whole city, the most helpful college consultant anyone has ever met, or even be a part of the famed Michael Scott Paper Company, but if your potential consumers don’t feel drawn to your businesses, you will never get the chance to close the deal. Signage is a powerful tool to make the best first impression because for many of your customers, it is their first interaction with your business. Whether it is your powerful Monument Sign that they see when driving by your business on the street or the graceful Lobby Sign they see hung on your wall when they walk into your store, signage gives you the opportunity to sell your company without having to utter a single word. While Amazon may have an advantage in its range of products and its speedy delivery, there are several areas in which you can beat them. Signage provides the chance to fight back at Amazon because it gives customers back some control, it is the original form of marketing, and it enhances the customer experience. Additionally, if your sign is made out of quality materials, it will send a powerful message to potential buyers and impress your clients. Fight back at Amazon your own quality sign. Call Landmark Signs today! (714) 637-9900. Brick and mortar stores are no strangers to competition. In fact, roughly ten years ago, small businesses were in trouble whenever a new Walmart would pop up in a town. Studies found that the closer a small business was to a Walmart, the more likely it was to end up closing. For every closer a mile was to Walmart, it was 6% more likely to close, while a whopping 35-60% of stores that were located the closest would go out of business. (Source). Walmart was certainly an entity to be reckoned with. However, this was mostly a threat for smaller businesses that did not have the same marketing budget as the bigger companies, like Best Buy, JC Penny, and Toys R’ Us who managed to weather the Walmart storm cloud. Fast forward to today though, and these brick and mortar stores are quaking and folding in the force of a much more formidable foe, one whose omnipresence makes it a threat no matter where a store is located. Being that most of you are business, you most likely have already guessed that I am referring to the online giant, Amazon. JC Penney closed 140 of its stores in 2017 and announced that it will continue to close stores this year. Best Buy plans to close all 250 of its mobile phone stores. Toys R Us just recently released a statement saying that it will close or sell all 735 of its stores bringing an end to the only store that really seemed to be ours as children as we strolled happily through aisles and aisles of dolls, games, and action figures (we are in intentionally leaving out the countless temper tantrums that could easily ruin the nostalgia we’ve reminded you of). Even Walmart is not immune, which will close 63 of its Sam’s Club locations impacting 9,400 employees. So what does all this mean for you and your business? Well, whether you are a small business like ours, or a Fortune 500 company, upping and adjusting your marketing strategy and making the in-store experience more authentic for customers seem to be the direction many are recommending. We concur with these strategies and luckily, we are in a business that provides a solution to both of these methods. Let’s break down a few reasons why signage can be the answer to fighting the competition. Research has found that customers go to brick and mortar stores because they are looking for authentic shopping. In a world where they are bombarded by constant in their face marketing, customers are tired of being aggressively sold to. We cannot even look at our cell phones without getting a text from some company advertising their products even though we have no memory of signing up for these messages. When we reply to this communication with STOP in all caps, we really mean it! Signage, like Monument Signs or Store-Front Signs, gives consumers the chance to take back some control of when and where they choose to learn about a store and its products. If they see your sign and are interested, they will come to you and if not, they can move on without their day being disrupted. Furthermore, according to the research, with a brick and mortar store, most of your consumers come from within a 5-mile radius, which means that potential customers will have the chance to see your company twice a day or roughly 60 times a month. That gives them plenty of time to decide if they want to check your business out without the frustrating experience of being bombarded wherever they go. Don’t be just another company that tries to aggressively convince consumers to give them a try with the next “best deal”. They get enough of that. Let them see your impressive signage and come to you. It does not get much more authentic for customers than signage, which is a form of advertising that dates back to the ancient Egyptians, Romans, and Greeks. The Romans used stone or terracotta signage to announce public events. Later, during China’s Song Dynasty, people started using signage for effective branding. window displays, gold leafing, and sign painting were the norm for signage advertising (our owner actually learned to create signage with his dad painting by hand). We can still see hints of these past signs today! Then in the 1980’s the emergence of neon signs took center stage and since then, this more permanent, long-lasting type of signage continues to dominate the sign industry today. In a world of online businesses and temporary, ambiguous marketing that floats through the internet like a cloud in the sky, advertise your long-lasting, permanent business with signage that dates back to ancient times. What can be more authentic than that? Bloomberg Businessweek survey revealed that “delivering a great customer experience” has become the new imperative: 80% of the companies polled rated customer experience as a top strategic objective. This is different than simply providing great customer service, which is an aspect of a customer’s experience. But what exactly is the elusive customer experience? Well, according to the Harvard Business Review, it is “the sum-totality of how customers engage with your company and brand, not just in a snapshot in time, but throughout the entire arc of being a customer.” It is said that all the little things add up in the end, and this is another way of looking at the customer experience. It is all the ways that a customer interacts with your company from the coffee and snacks that are served in your lobby to the day they sign on the dotted line. And one important component of a customer’s experience is your signage. With more than two-thirds of consumers believing that the quality of a business’ signage is directly related to the business itself, it is imperative that the signage component of the customer experience (from Monument Signs to Lobby Signs) make the right impression on your customers. To stand out to your potential customers, choose not just any sign, but a Landmark sign. Call us today at 714-637-9900! Or shoot us an email to get a quote. Last week, we learned 3 Reasons Why Monument Signs Are A Must-Have For Your Business. These three reasons were to show the permanence of your business, reach more local customers, and be easily located from the street. But maybe you are still are not convinced. You have a storefront business sign and window graphic for your business, isn’t that enough? Well you are in luck, because today, we are going to look at 3 more reasons why Monument Signs are a must-have for your business. The wonderful thing about Monument Signs is that they are extremely customizable. This means that you can have a Monument Signs that reflects the exact message that you want your customers to understand about your business. And being that recent studies show that more than ⅔ of consumers think a sign is directly reflective of the business and its products and services, the importance of this cannot be overstated. If we are doing the math right, that means that if a sign does not reflect well upon a company, it risks losing 2 out of every 3 potential customers. Wouldn’t that be a shame for a business like yours, that works so hard to take care of its clients? So just how custom-made are these signs? Well, the possibilities and combinations are endless thanks to our award-winning sign design team and expert manufacturers. Want to make sure your Monument Sign is visible at night? Try an illuminated Monument Sign. What about a Monument that reflects the elegance of your company? You cannot go wrong with a Gold Lead Monument Sign. Maybe you want to appear solid and dependable. Try a Wood Monument Sign. Do all of these options appeal to you? Get a Monument Sign with all three! Just make sure it sends the right message to your potential clients so you have the opportunity to wow them with your service as well as your sign. In a marketing world that bombards customers with Facebook and Google ads, having a quality Monument Sign not only helps you stand out from all the other forms of advertisement, but they are also marketing that keeps on giving. Online ads require constant funding and do little to tell your customers that you are here to stay. Any brand new business can create an online ad. But you are not just any business, and having a monument sign serves as a form of marketing that will be long-lasting and show that your company is not going anywhere because neither is your Monument Sign. As we established in our last blog, much of your business comes from local customers. And if your store is not located right on the street where your 3D Sign can be easily seen or is in a shopping center with many other stores, then the first impression your customer will have of your company is not your Store-Front Sign or Window Graphic, but your Monument Sign. If your company has a long-lasting, elegant, well-designed Monument Sign, then you have already made a wonderful first impression without having to lift a finger! And we can see, this positive first impression is likely to last and be even more affirmed by their interaction with you and your wonderful products. After all, you are what works about your business. Our sign business is just here to make sure people get a chance to find you and experience your stellar service first hand. To make a positive first impression that lasts with your very own custom-made Monument Sign, call Landmark Signs to get started on your Monument Sign today! Monuments: our country is obsessed with them. From coast to coast: the Statue of Liberty in New York to the USS Arizona Memorial in Honolulu, Hawaii. In fact, the United States has 117 national monuments, with a plethora of them located in our nation’s capital including the Lincoln Memorial, the Vietnam War Memorial, and the Martin King Luther Jr. Memorial. What is it about these monuments that are so appealing to us as a country? We travel thousands of miles across numerous states to gaze up at a large marble, carved statue of a historical figure or a graze our fingers across unknown, inscribed names on black granite wall while other tourists brush past us, bumping shoulders and elbows who are just as anxious as we are to see these same immoveable sights. There is something awe-inspiring about taking in these monuments. What they represent, their permanence, the message they send is of a country that has been free for close to 250 years and has overcome these struggles still together. And that is exactly what a Monument Sign can do for your business and your customers. It is not merely a large, stone, acrylic, or wood sign with your company’s name etched across it. It stands for something more; it stands for your business and all that your company has done and will continue to do for your current and future customers. Much like the Monuments in the United States, Monument Signs more than almost any other sign show your customers and potential customers that you have been here and you are not going anywhere. A Store Front Sign can be removed with little hassle, some patch, and a little bit of brush up paint. A Window Graphic can be peeled off with some elbow grease and paint thinner. But a Monument Sign? That sign isn’t going anywhere. Your customers will see a Monument Sign and understand that you are a dependable, solid, and permanent company they can count on. As we discussed in our blog a few weeks ago, many of your customers come from within 5 miles of where your store is located. According to Brandon Gaille, a marketing expert, in his article entitled 29 Striking Statistics on Effective Outdoor Signage, “That means the average person will see your sign about twice per day, or about sixty times per month” (Source). With an elegant Monument Sign, you are sure to reach more local customers who are out there looking and needing to try what only your business can provide them. They just have to know that you are there. We’ve all been here before: we only have 30 minutes on our break to try out a new lunch spot that our coworker recommended. After getting off the phone with a client later than planned, we rush out to our car, hit too many red lights, and finally arrive at the shopping center with only 15 minutes left to grab a quick bite. We thought our destination was in this shopping center, but without a Monument Sign to assure us and with so many other hair stylists, grocery stores, and fast food spots in the same center, we can’t seem to find it. Ugh! Forget it! Taco Bell it is. Many businesses are located back from the street or in a shopping center with many other competing businesses. While a store-front sign is almost always necessary, sometimes it is not enough to stand out from your competitors or be easily found by your customers. Don’t miss out on a potential customer simply because they do know now how to find you. Monument Signs help bring in a customer and keep a customer. To make a reach more customers, be easily found from the street, and show your customers that you are here to stay, call Landmark Signs to get started on your Monument Sign today! Check back in with us next week for 3 more reasons why a monument sign is a must-have for your business.